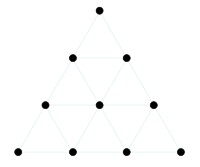 The tetractys (Greek: τετρακτύς), or tetrad, or the tetractys of the decad is a triangular figure consisting of ten points arranged in four rows: one, two, three, and four points in each row, which is the geometrical representation of the fourth triangular number. As a mystical symbol, it was very important to the secret worship of Pythagoreanism. There were four seasons, and the number was also associated with planetary motions and music. The four rows add up to ten, which was unity of a higher order (The Dekad). The Tetractys symbolizes the four classical elements—fire, air, water, and earth. A prayer of the Pythagoreans shows the importance of the Tetractys (sometimes called the "Mystic Tetrad"), as the prayer was addressed to it. As a portion of the secret religion, initiates were required to swear a secret oath by the Tetractys. They then served as novices for a period of silence lasting five years. by him, with faith find oath, I swear to thee." It is said that the Pythagorean musical system was based on the Tetractys as the rows can be read as the ratios of 4:3 (perfect fourth), 3:2 (perfect fifth), 2:1 (octave), forming the basic intervals of the Pythagorean scales. That is, Pythagorean scales are generated from combining pure fourths (in a 4:3 relation), pure fifths (in a 3:2 relation), and the simple ratios of the unison 1:1 and the octave 2:1. Note that the diapason, 2:1 (octave), and the diapason plus diapente, 3:1 (compound fifth or perfect twelfth), are consonant intervals according to the tetractys of the decad, but that the diapason plus diatessaron, 8:3 (compound fourth or perfect eleventh), is not. The Tetractys [also known as the decad] is an equilateral triangle formed from the sequence of the first ten numbers aligned in four rows. It is both a mathematical idea and a metaphysical symbol that embraces within itself—in seedlike form—the principles of the natural world, the harmony of the cosmos, the ascent to the divine, and the mysteries of the divine realm. So revered was this ancient symbol that it inspired ancient philosophers to swear by the name of the one who brought this gift to humanity. Symbol by early 17th-century Christian mystic Jakob Böhme, including a tetractys of flaming Hebrew letters of the Tetragrammaton. A tetractys of the letters of the Tetragrammaton adds up to 72 by gematria. The relationship between geometrical shapes and the first four Sephirot is analogous to the geometrical correlations in Tetraktys, shown above under Pythagorean Symbol, and unveils the relevance of the Tree of Life with the Tetraktys. In a Tarot reading, the various positions of the tetractys provide a representation for forecasting future events by signifying according to various occult disciplines, such as Alchemy. Below is only a single variation for interpretation. The first row of a single position represents the Premise of the reading, forming a foundation for understanding all the other cards. The second row of two positions represents the cosmos and the individual and their relationship. The Light Card to the right represents the influence of the cosmos leading the individual to an action. The Dark Card to the left represents the reaction of the cosmos to the actions of the individual. The third row of three positions represents three kinds of decisions an individual must make. The Creator Card is rightmost, representing new decisions and directions that may be made. The Sustainer Card is in the middle, representing decisions to keep balance, and things that should not change. The Destroyer Card is leftmost, representing old decisions and directions that should not be continued. The fourth row of four positions represents the four Greek elements. The Fire card is rightmost, representing dynamic creative force, ambitions, and personal will. The Water card is to the right middle, representing the emotions, feelings, and whims. The Air card is to the left middle, representing the mind, thoughts, and strategies toward goals. The Earth card is leftmost, representing physical realities of day to day living. "The tetractys could be Britain's answer to the haiku. Its challenge is to express a complete thought, profound or comic, witty or wise, within the narrow compass of twenty syllables. ^ Eduard Zeller. Outlines of the History of Greek Philosophy (13 ed.). p. 36. ^ A Dictionary of Greek and Roman Antiquities(1890) – William Smith, LLD, William Wayte, G. E. Marindin, Ed. Fideler, D. ed. The Pythagorean Sourcebook and Library. Phanes Press, 1987.